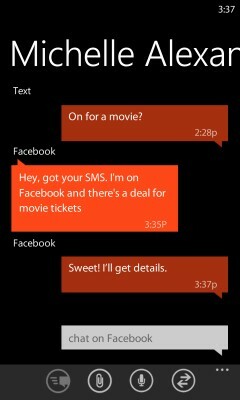 With Windows Phone 7, Microsoft was basically looking to get back into the smartphone conversation. With the next version, codenamed Mango, the company hopes to prove itself a social butterfly. Improved communications, along with better Web browsing and more powerful apps, were the key focal points as the company looked to make the first major update to its revamped phone software. On Tuesday, the company is announcing a host of new communications options that are among 500 new features that Microsoft is adding to its phone operating system in the “Mango” update due out later this year. The company is outlining the changes and sharing other details at a press event in New York that is just getting underway. (It’s being Webcast and AllThingsD has live coverage here). As part of its effort to be a better communicator, Microsoft is adding support for Twitter as well as tighter integration with Facebook and an integrated conversation feature that allows chats to move between Facebook Chat, Windows Live Messenger and text message all within a single “thread.” The company is also adding an option to let users combine contacts into various groups that can be reached en masse via email or text message. On the email side, customers will now have the option to combine views from various email accounts into a single inbox as well as view messages in either standard or conversation view. While apps are important, Microsoft is hoping to convince friends that when it comes to keeping in touch, it is better to integrate multiple modes into a single hub than to have to open a different program for each means of communication. “Our friends aren’t apps—they are people,” Sullivan said. That said, even with Mango, users will have to do some switching. The feature that lets discussions move from chat to text message doesn’t extend to email, while Twitter users will still need a separate program to handle more advanced tasks. Still, Microsoft hopes integrating more options into its People hub will help the company’s products stand out from rivals. Sullivan noted that Microsoft’s research shows people spend 2.5 hours a day socializing on their phone–more time than is spent eating. “It’s pretty dramatic,” he said. The Mango release of Windows Phone is due to show up on phones later this year. In addition to current hardware partners that are planning new phones, Mango will work on existing Windows Phone devices and will form the basis for Nokia’s first crop of Microsoft-powered phones.